Pocahontas, the Powhatan princess who befriended the Jamestown colonists, married the Englishman John Rolfe in 1614, and is believed by many to have saved John Smith's life—that is what the world knows about the Powhatan Confederacy. Her father, Powhatan, almost alone, united the small, scattered Algonquian tribes of present-day Virginia and Delaware into a 30-tribe group in the late 1500s. We know this group as the Powhatan Confederacy. The Confederacy included 128 Algonquian villages and 20,000+ people at its peak in the early 1600s. Powhatan and his people welcomed the English settlers in 1607 and helped them survive the first winter here by teaching them how to grow corn and tobacco, providing them medicine, and helping them hunt. But that relationship wasn't to last. Even so, for hundreds of years, people have told the story of a young Powhatan girl who was believed to have saved an English captain's life and established peace for a time between their peoples. Spring 1607 -- English colonists arrive at Jamestown. John Smith is captured and brought before Powhatan at Werewocomoco on the York River. According to Smith's account, Pocahontas saved him from death at her father's hands. Winter 1608 -- Pocahontas assists in bringing food to the starving English colony. She persuades John Smith to release some Indian prisoners. 1609 -- Powhatan orders his warriors to lay siege to James Fort, leading to the winter's "Starving Time," which killed several hundred colonists. 1609 -- Smith narrates that he was warned of an Indian plot on his life by Pocahontas. He leaves for England the same year. Pocahontas is told he is dead. 1613 -- Pocahontas is captured by Samuel Argall in the village of the Patawomekes and held for ransom. In three months' time, Powhatan returns seven English prisoners and stolen guns. Eventually, there is a fragile peace. 1614 -- Now christened Rebecca, Pocahontas marries John Rolfe. 1616 -- John and Rebecca Rolfe and their young son, Thomas, sail for England. 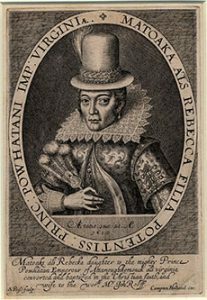 1617 -- Rebecca/Pocahontas dies en route to Virginia. Her husband returns to become secretary of the colony. Meanwhile, their child Thomas is raised by English relatives. He does not return until the 1630s and, through him, Pocahontas' descendants become prominent statesmen. 1622 -- Pocahontas' uncle, Opechancanough, leads a stealth attack, killing many colonists. 1644 -- Opechancanough leads another attack. 1646 -- English reprisals for Indian attacks greatly reduce the Powhatans' power and numbers by this time. The Treaty of 1646 separates several tribes who move south. 1665 -- The House of Burgesses passes a law (Act VIII) requiring the Powhatan to accept chiefs appointed by the governor. May 28, 1677 -- Treaty of Middle Plantation/Treaty Between Virginia and the Indians/Treaty of 1677 signed by representatives of King Charles II of England and representatives of the Pamunkey, Nottoway, Appomattoc, Wayonaoake, Nansemond, Nanzatico, Monacan, Saponi, and Meherrin tribes. They were guaranteed their territories, hunting & fishing rights, right to keep and bear arms, and more as long as they accepted being subjects to England, as well as other conditions. At the time of the colonists' arrival, the Powhatan Confederation contained more than 30 tribal groups. The Powhatan Confederation or Confederacy is also known now as the Powhatan Paramount Chiefdom. Yet another name for the Powhatan tribes were the Virginia Algonquins, as Algonquin is the language they spoke. There were an estimated 14,000 to 21,000 people in the Powhatan Confederation at the time of European contact. Chief Powhatan also had the name Wahunsunacawh. Two major population centers for the Powhatan were the capital village of Powhatan in or near what is now known as Richmond, Virginia, and Werowocomoco, on the north bank of the York River in what is now Gloucester County. Any of the local chiefs, who gave their allegiance to Powhatan, were known as weroances. A woman chief was known as a weroansqua. The Powhatans were at war with the Monocans at the time of European contact. The Monocans spoke the Siouan language, as opposed to the Powhatan tribes' Algonquin. Not having experienced diseases such as smallpox and measles for centuries, as the Europeans had, the native people had no natural immunity and were hit hard when epidemics struck. Although called "Powhatan's mantle," this fascinating artifact may have belonged to another chief in the Chesapeake Bay area. Later on, escaped slaves and indentured servants would sometimes go to live in Indian villages and intermarry. 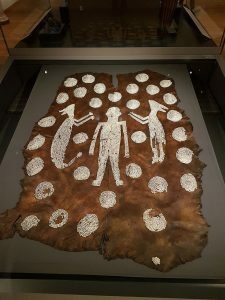 Today, you can find groups of people whose ancestors were part of the Powhatan Confederation or its neighboring tribes. As of this writing, the State of Virginia officially recognizes eleven tribes: the Mattaponi, the Pamunkey, the Chickahominy, the Eastern Chickahominy, the Rappahannock, the Upper Mattaponi, the Nansemond, the Monacan Indian Nation, the Cheroenhaka (Nottoway), the Nottoway of Virginia, and the Patawomeck. The Pamunkey and the Mattaponi still hold reservation land. Pocahontas was only Powhatan's daughter's girlhood nickname. As she met the English when she was just 11 years old, that was how they knew her. Pocahontas has been interpreted to mean, among other things, "naughty one" or "spoiled child." Her private name was Matoaka, meaning "Bright Stream Between the Hills," and she was also called Amonute. She had another name after she was baptized and married: Rebecca Rolfe. According to the oral tradition of the Powhatans, she is believed to have been married to a Powhatan Indian named Kocoum and to have had a daughter before she was kidnapped and held for ransom in 1613. However she was called, Pocahontas/Amonute/Matoaka/Rebecca lived a short but legendary life. After her three months in captivity, she remained with the settlers. She was baptized a Christian in 1614 and given a new name, Rebecca Rolfe before she was married to John Rolfe, a tobacco planter. They traveled to England, where she received much attention and finally met John Smith again, who was alive and well, despite what she had been told by the English earlier. In 1616, Rebecca Rolfe died en route to Virginia and was buried at Graves End. Her husband John Rolfe returned to the colony to become its secretary. Meanwhile, their child Thomas was raised by English relatives, eventually returning to Virginia in the 1630s. Her descendants through her son Thomas became prominent Virginia statesmen. Numerous people today report that they are her descendants through her first child with Kocoum. Many still live locally in the White Oak area. Our resource list, CRRL History: The Powhatan Confederacy, offers books and websites with a lot of information about Powhatan's people for students. From National Geographic, this handsomely illustrated book for young people draws on recent scholarship to retell the story of early contact between the Powhatan and the English at Jamestown. Beautiful illustrations and plain explanations make this an excellent choice to share with students who are interested in learning more about this tribe. A longer biography with many illustrations. Part of the North American Indians of Achievement series. This longer biography (173 pages), often used by upper elementary and middle school, takes the unusual approach of having alternating chapters from John Smith's and Pocahontas' points of view. The author is a well-known Native American storyteller and writer for young readers. Knudsen's Pocahontas makes an effort to separate what is known from what is conjectured. Even so, it has a lot of remarkable information about Pocahontas life, including her aid to the colonists in the first winter, her capture, conversion and marriage to John Rolfe. Often used in grades 2-3. 47 pages. This 32-page Rookie Reader tells Pocahontas' story, from her childhood to her encounters with the English settlers. Frequently used in grades 1-2. This 24-page book has the meeting of the Powhatans and the colonists from both points of view. The Powhatan saw life very differently from the Englishmen. Learn about their religion and society.